Born in a small village of the Champagne region of France, Fabien Duboueix has pursued a passionate career in wine and hospitality that has spanned 17 years and counting, and taken him to Europe, the UK, the US and now Singapore.His professional training began early in life with a Wine Trust Certificate awarded in 2001, and a series of F&B positions in restaurants in Germany, France, Ireland, England and Spain, including the 1-Michelin-star Lucknam Park in Colerne, England, and the 1-Michelin-star El Castell de Ciutat in Seo D’urgell, Spain.In 2003, Fabien traveled to the US to work in the White Barn Inn in Maine, and the Woodland Resort and Inn in South Carolina, both top-level Relais and Chateaux Five-Star Five Diamond establishments.In May 2009, Fabien became Food & Beverage Manager at the Mendocino Hotel in Mendocino, California; later returning to the Woodland Resort and Inn in Summerville, South Carolina, where he remained Food & Beverage Manager until January 2012. 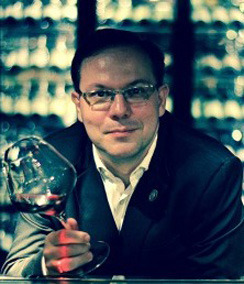 Throughout these years, Fabien was constantly gaining industry experience and studying to upgrade his skills.In 2011, he became a Certified Sommelier (CMS), and in 2012, a Certified Specialist of Wine (CSW). In May 2012, Fabien arrived in Singapore as Head Sommelier/Assistant Dining Room Manager at the Saint Pierre Restaurant, one of the leading French gastronomic restaurants in Singapore.Since December 2012, Fabien has been Head Sommelier at Joel Robuchon le Restaurant at Resorts World Sentosa, part of the Robuchon group of world-renowned restaurants. In the past 2 years, Fabien has added to his list of accreditations the Certified Spirit Specialist, and the Certified Sake Sommelier.In 2014 Fabien became an Advanced Sommelier from the Court of Master Sommelier, making him one of the very few sommeliers in this part of the world to have achieved such an advanced accreditation.Fabien, who speaks fluent English and Spanish apart from his native French, is intent on helping other wine professionals progress in their career through consistent skills upgrading, like he has done. He spends his off-hours organizing and tutoring ‘study groups’ and is happy that his efforts have borne fruit. One of the participants who is a good friend of his has become the best sommelier in Singapore.